Posted on Wed, Mar 28, 2012 : 5:11 p.m.
Shawn Hunwick wasn't the only former Michigan hockey player to have a big day Wednesday. Former defenseman Greg Pateryn signed a two-year contract with the Montreal Canadiens. 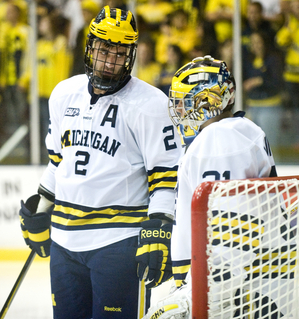 Greg Pateryn, left, signed two-year contract with the Montreal Canadiens on Wednesday, shortly after Shawn Hunwick, right, agreed to an amateur tryout contract with the Columbus Blue Jackets. Right around the same time Hunwick was getting a call from the Columbus Blue Jackets to fill in as a backup in Wednesday night's game against the Detroit Red Wings, Pateryn reached a deal with the Canadiens. Montreal traded for Pateryn's rights shortly after the Toronto Maple Leafs drafted the 6-foot-3-inch, 216-pound defenseman in the 2008 NHL Entry Draft. On Monday, Pateryn said the Canadiens had reached out to him requesting that he play for the team's American Hockey League affiliate Hamilton Bulldogs. Pateryn declined in order to finish his classes and graduate on time. Two days later, the parties came to an agreement. A release by the Canadiens did not disclose financial details of the contract or say when Pateryn will join the club. Easily Michigan's most physical defenseman this season, Pateryn — an alternate captain — had 15 points (two goals, 13 assists) and a plus-15 rating.